July 2001 (Vienna, EJF Summer gasshuku): He started Jodo and first time met Pascal Krieger Sensei and the teachers of EJF. Since this seminar he participated in every EJF/IJF Summer gasshuku in Europe. July 2002 (Sevenum, EJF Summer gasshuku): First meeting with Nishioka Sensei and on the same occasion he invited Fred Quant Sensei to come and teach in Zlin Czech Republic. The first Czech seminar with Fred was held in November 2002 and the Czech group started to develop. Since this meeting Fred visited Czech Republic twice a year till 2007. Since Spring 2008 once a year till now. January 2003: First time in Kagamibiraki (Cartigny) and since this one attended every Kagamibiraki. Gradually participated in more seminars with Pascal Krieger, Fred Quant and other teachers of EJF. March 2004: One day training with Pascal Krieger Sensei in Prague. June 2004: First meeting with Slovakian people interested in practice in Liptovsky Mikulas. Irregular meetings with them in Czech Republic or in Slovakia continue till now. May 2006: First time in Japan (Seiryukai Jodo gasshuku in Yoyogi/ Meiji Jingu Park with Nishioka Sensei). June 2006: Shodan examination (Wï¿½rzburg, EJF Summer gasshuku). April 2007: Organized the 10th Jodo seminar in Czech Republic with Fred Quant and Pascal Krieger as a guest. August 2007: Organized EJF Summer gasshuku in Kacov (near Prague). The first members of EJF from Slovakia participate. August 2008: Nidan examination (Guadarrama, EJF Summer gasshuku). July 2009: Second trip to Japan (IJF Summer gasshuku, Matsumoto). August 2010: Sandan examination (Tata, EJF Summer gasshuku). January 2011: Received Oku-iri sho from Pascal Krieger Sensei. April 2011: First time in Russia (Saint Petersburg) with Pascal Krieger Sensei. April 2012: Invited to Russia again and dispatched by EJF to help in creating a group. The seminars are scheduled annually since this meeting. October 2012: Helped with organization of the 1st Slovakian Seminar with Fred Quant Sensei. 4th January 2014: promoted as official teacher of the EJF by Pascal Krieger Sensei, Fred Quant Sensei, and all the other teachers of the EJF. 7th January 2017: Received Shomokuroku from Pascal Krieger Sensei with Fred Quant Sensei. He teaches Jodo in Zlin and occasionally in others locations of Czech Republic with the help of his wife Renata who also studies Jo since 2002. Aikido since 1992 (3rd Dan of Czech Aikido Federation). 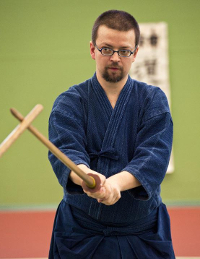 ZNKR Iaido since 2001 (3rd Dan). Kendo between 2000 and 2007. He organizes activities of Tenshin Dojo in Zlin - he teaches children (Aikido) and beginners.